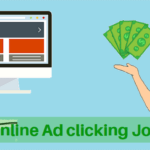 If you are searching for an online job to make money quickly without any investment then Content/Article Writing jobs would be a perfect method to start with. Article writing jobs are one of the stable ways to make money online because by writing content regularly you can make a stable income forever. In this post, I am going to teach you how to get paid by writing articles. Please read the content thoroughly to understand everything about Article Writing Jobs. Why Article Writing has a huge demand? How to earn money by Articles writing jobs? How will I get paid by iWriter? How to start earning from iWriter? Article Writing is an online content writing service where the writer gets paid by writing meaningful and unique content for companies or blog owners. The Articles can be written on any topic such as dogs, food, health, body building, weight loss, SEO, etc..
People from any country such as India, United States, etc… can earn money by writing articles. You can make a solid income forever(more than enough to leave your job) by article writing jobs so read this post clearly and understand how it works. There are many online companies and blogs who want unique content for their websites but they cannot write content on their own so, they depend on writers for content and they pay a certain amount of money based on the quality of the content. The companies and blog owners place their request for articles on sites called as iWriter & other. The writers write the required content for them and get paid to write articles online. How to earn money by Article Writing Jobs? On this page, I am going to teach you how to earn money by writing content/articles using iWriter. 1: You can start earning money by article writing jobs from today itself. 2: No investment and no pressure of work. 3: Nothing is required except a PC/Laptop with internet connection. 4: Earn money from home from your own comfort zone. Below you will find all the useful information about how to Get Paid to write articles using iWriter. 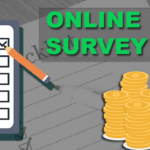 Please read it carefully and step ahead toward your first online income. How much can I Earn per Article on iWriter? 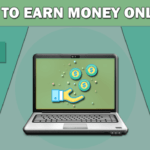 On iWriter, in the beginning, you will earn about $2.43 (Rs. 150) per 500-word article. But you can increase that amount by writing more articles while maintaining good ratings. iWriter has different payment amounts for different writers per article. 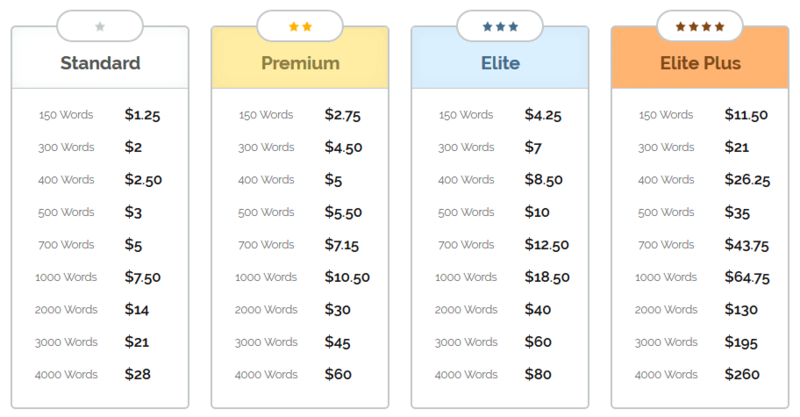 After you write 30 articles and maintain an avg ratings of 4.1 – 4.5 then you will be promoted to Premium Level and your earnings will be $4.46 per 500-word article. And if you maintain an avg of 4.6+ then you will be promoted to Elite Level and your earnings will be $8.10 per 500-word article. The below table describes variation in earnings for different levels. Content writing jobs on iWriter. There is another level on iWriter and it is called as Elite Plus. If become an Elite Plus member you will be earning $32.40 per 500 word article. And there are other types of writing services on iWriter such as writing blog posts, press releases, eBooks & Kindle eBooks. There is more higher earning for those kinds of writings. The below calculation is based on $2.43 per 500-word article. Let’s say you work 4 hours per day. So, at $2.43 per 500-word Article, if you write 4 articles daily then you can earn $291.6 per month. However, you can increase your earnings by maintaining higher ratings. Try to produce good content in order to maintain higher ratings. Remember if you have 4.6+ ratings after writing articles 30 then you will earn $8.10 per 500 word article. 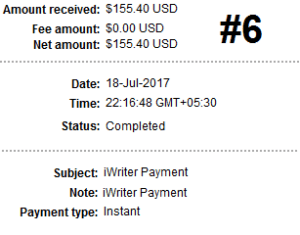 At this rate, if you write 8 articles in 8 hours then you will earn $64.8 in a single day(awesome). 1: First, create an account on Iwriter. Now fill the registration form and click on “WRITE CONTENT NOW” button. If you are asked to verify your email address then do it. 3: Search about the topic on google and read old articles. 4: Understand about the topic and start writing. 5: Once the client approves the article you have written then you will get paid. Never copy content from other sites because clients need unique content. 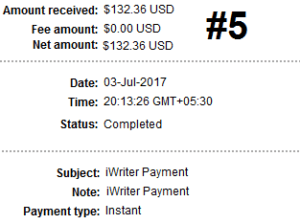 iWriter pays only via PayPal. The Minimum amount to get paid is $20. The money you earn from Article Writing Jobs on iWriter will be paid to your PayPal account and from PayPal account you can transfer the money to your bank account. 1: After you complete your registration, login to your account then you can see your dashboard as shown below. 2: On your dashboard click on “Write Content” tab to find a list of articles to be written. Remember: As a beginner, you can only write content which are available only for Standard writers. Next click on “Write Article” button, now you will be taken to a page where you will have to answer some basic grammar questions. Here you will be asked to answer 15 questions consisting of choose the correct answers and you need to answer at least 13 questions correctly to pass. If you pass this test then you will never be asked to answer any more questions again & from then you can start writing any number of articles. If you fail the test then you will not be allowed to write articles, but don’t worry as you can try again after few days. After you have passed the test, click on “write article” tab again and select the article. A time limit box will appear on the top right side corner of the page, make sure you submit your article before the timer ends. On the top left, all the instructions related to the article will be shown. After you’ve done with your research and got a good idea about the topic then start writing. 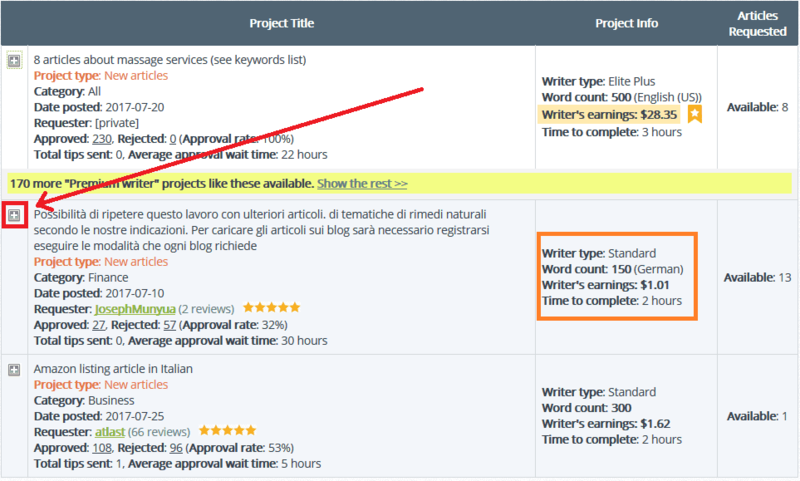 Try to include all the keywords mentioned by the client in the article multiple times. You can write more words than the specified word count but you cannot writer lesser than that. After you’re done with writing, submit your article. Once you’ve submitted the article, the client will receive the article after a Copyscape verification. Copyscape verification is done to check whether your article is not directly copied from other websites. After receiving the article, the client will check and approve/reject it. When the client rejects your article then he will have no access to your article and your article will be safe for further use. If the article is not approved/rejected within 3 days then your article will be auto approved. If your article is approved then the amount will be added to your account balance and you will get an email. After your article is approved then you will get a rating from 1 – 5 by the client. Try to write good content without any mistakes for higher ratings. After you have $20 in your account you can request for payment and you will be paid to your PayPal account. Note: If iWriter is not accepting new writers then you can try Freelancer or ContentMart to earn money by writing articles. How to Create a Blog in 2018 and Make Money Online? iWriter is the best and the most popular content writing jobs service. iWriter is online since 2011 and is going very strong. According to Alexa rankings, iWriter is one among top 40k ranked websites in the world. On iWriter you can earn from $2.43 – $32.40 per 500-word article. Hence, iWriter is the best available writing service for content writers. iWriter Review is now complete. If you have any doubts regarding iWriter then you are free to comment below. Can I write articles by referring other books? but please make sure that the content you write is not copied from other sites.